New Vista’s flagship STHs are the most popular and widely used Thread-Verification and Thread-Reconditioning Units in the world. Favored for automated and robotic applications, the STHs were first introduced to the market in 2006. Having made an early reputation for reliability, today’s models will run either male or female threads; they are more compact, easier to integrate, and accept more accessories than ever before. STHs have always been offered in either DC motor or servomotor versions, with the servomotor type the most popular. The newest STHs are now accompanied with a preprogrammed local PLC and a touchscreen HMI, and they are readily integrated with all the popular machine control conventions. You can see several STHs in action at the newvistacorp.com VIDEO PAGES, especially Videos VSTH8, VSTH9, and VSTH11. For fast cycle applications see VIND4 and VIL2Y. With over twenty different variations, you are guaranteed to receive a Unit optimized for your application. STHs can handle thread sizes from M2 to M50 (#2 to 2 inches), with cycle times as low as 0.6 seconds. 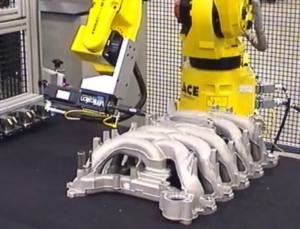 STHs are often used in robotic applications, where thread gage members can be changed automatically, employing New Vista’s Tool Docking System. In this way, several different thread sizes are checked in sequence without any manual involvement. Visit the newvistacorp.com STH Catalog Page for more details. Expert applications service is available from our U.S. location, and in several other countries as well. Please inquire.